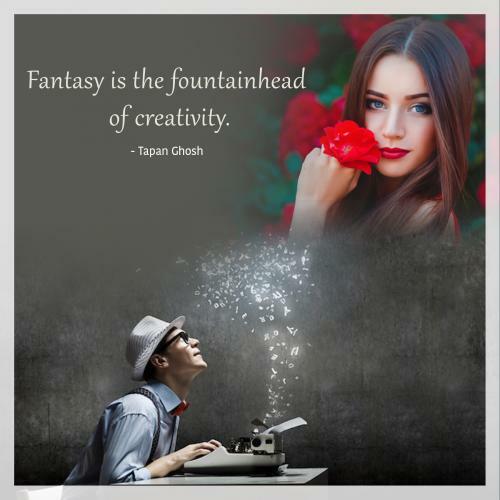 Fantasy is the fountainhead of creativity. Treasure your Ideas, for they are like seeds that germinate in your mind. They Root, Shoot, and Fruit into Concepts & Creativity that are beyond Imagination. To live a vibrant & purposeful life keep your mind on high alert, eye open & make sure of your target. No one can hit target with closed eye & clouded mind. With open eye one can see things that are invisible & that demands innovation & creativity. Creativity is a great motivator because it makes people interested in what they are doing. Creativity gives the possibility of some sort of achievement. It makes life more fun and more interesting. Log can be chopped up and be made into wood. Clay can be shaped to make pots. But it is the space that makes these useful. So we must find the space within us. Creativity is the mother of all invention . If you want to succeed you should strike out on new paths rather than travel the worn paths of accepted success. Take every risk to explore new ideas and be authentic yet absolutely creative. Every ideas arise when man gets bored of the common things and wants to create something that was unseen or unheard of. Challenges don't get me to quit, they push me to think harder and reveal my creativity and strength. Creativity is essential not only for artistic talents but also in every action that we perform. Creativity gives a sense of freedom, interest and also is a reflection of your inner feelings. Creativity distinguishes the talented from the ordinary and an exposure in wider sense. Mary Lou Cook once said, “Creative is inventing, experimenting, growing, taking risks, breaking rules, making mistakes and having fun”. 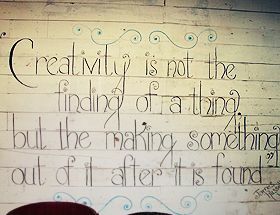 This quote summarizes the meaning of the word creativity. If you are creative, you stand apart or you will be just another person lost in the crowd. Creativity gives you an elevation, a distinction and the urge to do better and better and finally, appreciation. So, be creative and be unique. It is the first attempt to climb the ladder of success. Here are quotes on creativity that will help you to get inspired and achieve great things in life.